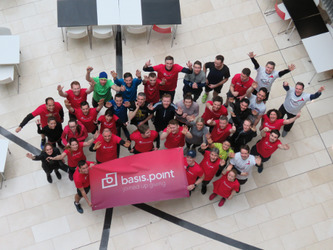 basis.point expects to grow this year with the help of an exciting John Hancock Boston Marathon campaign. The initiative by the Irish Funds Industry aims to make a real and visible difference - by supporting educational programmes for disadvantaged children across Ireland. Thanks to the support of John Hancock, the principal sponsor of the Boston Marathon, basis.point has been selected by the John Hancock Non Profit Programme to receive a charity bib for the 123rd Boston Marathon. The Boston Marathon is one of those inspirational events that connects the entire world in a spirit of competition, camaraderie and community. 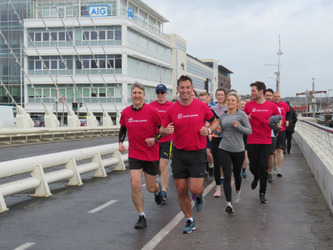 Last week saw the first of a number of training runs with Richard in Dublin. 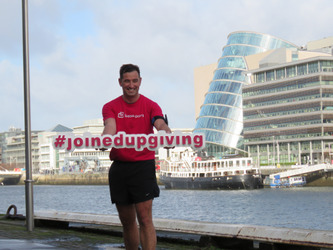 Thanks to the newly formed basis.point Supporters Committee who helped spread the word, Richard was joined by a number of supporters, home visitors, friends and colleagues to run on a wild and blustery Dublin morning to show support and boost morale. As we know supporting good causes isn’t only about donating money, it’s also about giving of time and talents, and this show of support was a great example of that in action. Richard has set himself an ambitious target to harness this energy and raise €50.000 to open doors for children through education. He is particularly connected to the work being done by two programmes that are helping children and families in the community. Both the Incredible Years Programme which is run by Archways and the Parent Child Home Programme, which is run by The Early Learning Initiative (ELI) of The National College of Ireland are active in the area. In fact ELI employs specially trained local women to visit families of pre-school children in their own homes, some of whom were able to join him last Thursday on his run. “I love the fact that these initiatives are bringing a shared purpose to the local community. We support the initiatives financially, the programmes are managed by local charities and local women are trained to provide the community support in their own homes. We all share the same goal of opening doors for children and offering them a better chance at education,” he said. The funds raised will allow us to expand the geographic reach of these and other already proven initiatives. According to Day, who describes himself as a weekend warrior yet is an accomplished marathon runner nontheless, the John Hancock Boston Marathon is one of the most iconic marathons in the world. First run in 1897, it is a proving ground for world class athletes and weekend warriors alike. Juggling preparation for the marathon with a busy home life and demanding career hasn’t been easy. Creativity has never been an issue for Richard and the trainers are packed for every business trip! Richard will be running alongside 30,000 athletes some 250 of whom will be representing Ireland and they will be cheered on along the route by up to 500,000 spectators. This year nine returning Boston Open Champions will compete as well as seven wheelchair Champions. These athletes, as well as many other weekend warriors, inspired by the strength and courage of the individuals and causes they run for, all embody the power of the human spirit. basis.point is growing its team of ambassadors with the recent launch of a new Supporters Committee. It now has ambassadors in BBH, RBC, BNYMellon, Northern Trust, Matheson, William Fry, State Street, Carne, Linedata and Citco and over time hope to have an ambassador in each of the companies operating in the Irish Funds industry. The support shown to Richard on his training run is an example of new and exciting initiatives. Complementing the Patron membership category, Supporters are an important part of the basis.point movement and can benefit from networking opportunities, early booking options, volunteering options and engagement with associated charities. In addition to providing a better flow of information on the many educational programmes that basis.point is supporting, this new committee offers a welcome channel for the many industry colleagues who want to get more actively involved with basis.point activities and to network with their peers. basis.point is well on the way to achieving the fundraising goal of €50,000 thanks to very generous corporate and individual patron donations including KPMG, Maples, ML Capital, Northern Trust and RiskSystem. These, together with the donations flooding in from members of the supporter programme and corporate donations in the pipeline, mean that basis.point is optimistic it will hit its target. By working together to address the issue of educational disadvantage basis.point is making a difference to children’s lives throughout Ireland. Joined up giving makes a difference. This article appeared in the April 2019 edition.